This guide assumes that the user is familiar with wysiwyg’s importing basics as described in the Reference Guide; it by no means describes everything that needs to be done in order for a CAD file to import into wysiwyg, only the most common actions that may need to be taken. Since every CAD file is different, it is literally impossible to write a step-by-step import procedure, or devise a set of rules/actions, which cover every import scenario or guarantee a successful import. Many CAD files require no modifications at all, while others only need to be modified slightly, following only one or two of the suggestions below; others still, may require a large number of changes in order to import correctly—some which are not even listed below because the need for them has never come up and are therefore unknown. All this considered, the following is merely a set of guidelines and suggestions for using AutoCAD to modify files in order to make them “importable” into wysiwyg. The following information must be known about the file that’s about to be imported; if it is not known and cannot be obtained from the file’s author, AutoCAD must be used to collect it. The model’s scale. Some CAD applications can be used to draw to scale and/or to save in scale; since wysiwyg only uses real-world measurements, ideally only files drawn/saved in one-to-one scale (i.e. with “real-world measurements”) should be imported. To ensure that the model has imported correctly, it is recommended that one or two known distances are checked (using wysiwyg’s Distance or Dimension tools) once the import is complete. If the model was drawn at scale, or the file was saved in scale, the (self-explanatory) Custom option in the Scale step of wysiwyg’s Import Wizard may be used to define how the model should be resized. While it is by no means imperative for the following actions to be performed before import is attempted, doing all this will definitely make for a smoother import process. If AutoCAD is not available/accessible to the wysiwyg user, the file’s author (who has access to AutoCAD, since he or she created the file in the first place) should be asked to perform them and then re-save the file for import. Move the model to the origin. Depending on how the CAD file was created, the model may have been drawn far from the origin. While this does not matter to AutoCAD (since its drawing space is virtually infinite), it does matter to wysiwyg (where the drawing space has limits), so an imported model may end up so far from the origin that it becomes difficult or even impossible to find. To check the model’s position (in AutoCAD) simply hover the cursor around it and look at AutoCAD’s coordinates display; if it is away from the origin, enable all layers (i.e. turn on and unfreeze and unlock them), select everything (CTRL+A), and move it all to surround the origin. Set the drawing limits to contain the entire model but no more. Even if the model is moved to the origin, it is a good idea to define its limits; a model’s limits are the extents of the area that it occupies, and are defined via AutoCAD’s limits command. Purge the file. Preceding the last save before import is attempted, always purge the file in order to remove any unnecessary contents from it; do this by using AutoCAD’s purge command. There are many advantages to purging the file before importing (instead of relying on wysiwyg’s Purge function to do this afterwards). Top among these is the fact that AutoCAD “knows its files” better than any other software could, so it can “make better decisions” about what to purge. Another very good reason to purge before importing is to avoid importing (or attempting to import) unnecessary objects, which may lead to import errors. Finally, purging reduces the file’s size, and makes easier/faster for wysiwyg to process the import. Naturally, the file should be purged again every time any changes (such as the ones described in the next section) are made to it. The list of objects that wysiwyg can import (and any additional/necessary details about each) may be found in the wysiwyg Reference Guide. This list has grown over the years, but there are still some objects which cannot import; some such objects simply do not make sense to import (and so they never will) while others will be added to the import routines in future versions. wysiwyg is good at ignoring objects that it cannot import, but it is always preferable for such objects to be removed from the file prior to the import, because it makes little sense to process them only to have them be discarded almost instantly; in addition, removing such objects before importing the file also allows the file to be purged, which may result in additional associated objects being removed from the file (objects which are most likely irrelevant for the import anyway). Note: some of the suggestions below ask for all objects of the same type to be selected in order to be manipulated at once. The easiest way to perform this selection is via AutoCAD’s Quick Select tool, which is available at the top of the Properties side panel or by typing the qselect command. Proxy Graphics and Raster Image objects cannot be imported and should be removed from the file prior to import. Hatch objects cannot be imported at this time. If they are crucial to the model, and WYSIWYG’s own hatching does not provide a suitable replacement to the hatches from the file being imported, they may be exploded via AutoCAD’s explode command; this turns them into individual Line or Point objects (depending on the type of hatch used) and they will However, this option must be used in moderation and with great care, as explodeing complex/dense Hatches has the potential to create hundreds/thousands of extra objects in the file, resulting in complex/slow imports and, potentially, unusually-large and poorly-performing .wyg files. Hatches which do not need to be imported should be selected and deleted from the file; if no Hatches at all need to be imported, select them all via Quick Select and delete them. Nested Blocks used to have to be exploded before importing the file, but this is no longer necessary as of R39. In fact, in most cases, it is actually better not to do this unless WYSIWYG suggests it once the import is complete (as it will do if an imported Block contains more than 65,535 vertices). The only exception here is if the file contains only one very large Block, or several, each consisting of more than 65,535 vertices; in such cases (which are rare), the file must be opened in AutoCAD, the Block(s) must be selected and exploded, the file must be purged and saved (with a new name, so as not to overwrite the original), and the import must be attempted with this new file. Ensure that the file being imported has not been corrupted. (A corrupt file will generate unusual errors while WYSWYG attempts to import it, and will not open in AutoCAD or in DWG TrueView or Autodesk Viewer, which are available free-of-charge from https://www.autodesk.com/products/dwg/viewers.) A file may become corrupt as a result of bad media (eg. a bad/corrupt USB stick) or network errors during transfer. If for some reason these applications cannot be used to check if they can open the file, the only thing to do is determine the file’s hash value using a hash calculator, and compare it with the same value obtained from the computer where the file originated; if the two values do not match, the file has been corrupted and will have to be transferred again. One way to prevent corruption is to compress the file into a .ZIP or .RAR archive before transferring it; once the transfer is complete, if the .ZIP or .RAR file opens successfully, the CAD file within is virtually guaranteed to be fine (and its hash value will match that of the original). Use AutoCAD’s Write Block feature to create an AutoCAD-native file. This procedure applies to CAD files that weren’t created in AutoCAD, but in some other application, and then exported to .DWG or .DXF format; if it is known that this is how the CAD file came to be, or if WYSIWYG displays Load Errors “39”, “50”, or “65” during an import, there is a good chance that “converting” the file to an AutoCAD-native file will get it to import. To do this, open the file in AutoCAD, select everything (CTRL+A), use the wblock command to create the new file and then import that file. Use Write Block to create a new file which only contains the part of the model required for import. Optimizing the geometry in a CAD file (as discussed in this thread on the CAST Software Forum) is essential for performance, so files should always be analyzed for optimization opportunities. A prime candidate for optimization is content that is irrelevant to the lighting design. Such content must be removed from the file before import. (For example, only the venue itself should ever be imported, not its entire site plan.) To do this, open the file in AutoCAD, turn Off and Freeze and Lock the layers containing irrelevant objects, select everything (CTRL+A), and use the wblock command to create a new file to import. Importing layer-by-layer or a few layers at a time can also benefit complex files which contain large numbers of layers, by streamlining layer management and by providing a (potentially) less cluttered file to work with. This is especially true if a 2D model needs to be imported in order to be used as the basis for creating a 3D model; in such cases, the layers containing the venue would be imported first and then extruded as necessary in order to create the 3D model of the venue; this would be followed by merging the ‘hang structure’ layers (using wysiwyg’s File > Merge command in CAD mode), raising the lines to the appropriate heights, and converting them into pipes (or using the lines as a guide to create truss structures with Truss from wysiwyg’s library); and so on. The only caveat to importing layer-by-layer is that the process can take a long time, because wysiwyg must process the entire file for import before it can display the list of layers to import. As such, importing a few (related) layers at once is preferred over a importing a single layer at a time. If, after performing the appropriate/necessary tasks described above, the file still does not import, please login to the Members Only Area of the CAST Software website and open a Tech Support ticket for assistance with the import. Please note the following important points regarding import assistance. 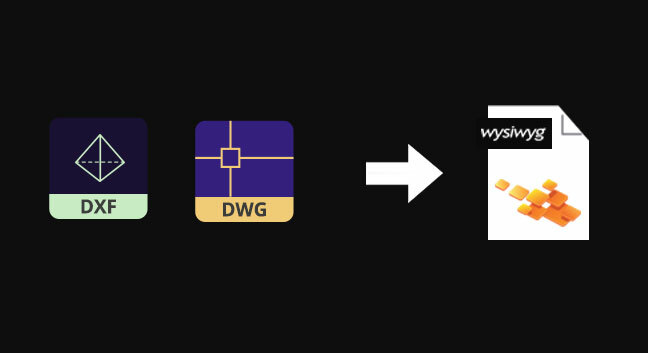 In order to qualify for import assistance, the Membership on the dongle being used to run wysiwyg must be current. Ensure that both the original file AND the file modified as per the information above are attached to the case; please compress the two files into a .ZIP or .RAR file and attach this compressed file. If the file can be imported successfully, the Technical Support Department will provide (extensive) information about the steps that were required (beyond the above) in order for the import to succeed. It is strongly recommended that this information is retained for future reference, to be used the next time a problematic import is encountered. The “importable” version of the file, as well as the resulting .WYG file will also be provided. CAST Software cannot guarantee a successful import; this is rare, but there have been cases where the CAD file simply could not be imported, even after being analyzed by our Software Development Department. In such cases, the Technical Support Department will provide additional information regarding the failure, and potential next steps. Import assistance is not part of standard technical support, but is provided as a courtesy for the first two or three unsuccessful import attempts encountered by customers. Beyond that, customers are expected to modify CAD files for import themselves, using AutoCAD and the information that was provided as part of the cases for which assistance was rendered. Download PDF printable version of the CAD Importing article.